Recently we at Crossbikereview.com received a new pair of sunglasses from one of the newer sunglasses companies, Advanced Multisport Optics (AMO) Sunglasses out of Hong Kong. They sent us their top of the line cycling sunglasses the Ironcatcher which features either one of two lens packages, a 100% poly-carbonate lens or their premium NXT lenses, both lenses are vented to improved air circulation, and the lenses are interchangeable. The Ironcatcher’s use of a flexible thermoplastic TPR nose piece and Hytrel flexible temple arm with Grilamid TR-90 frame make for a comfortable fit. 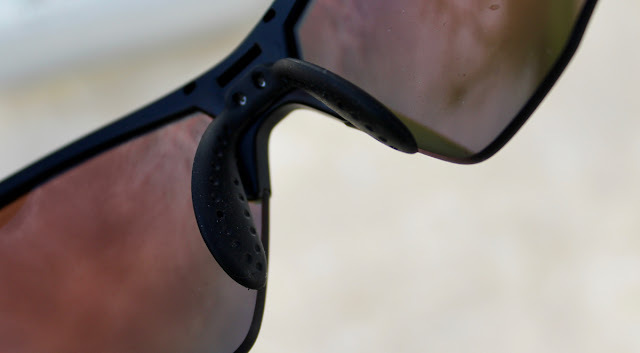 As with most sunglasses the Ironcatcher’s are 100% UV A & B protection, unlike most sunglasses the Ironcatcher comes with hydrophobic coating to repel water and mud. 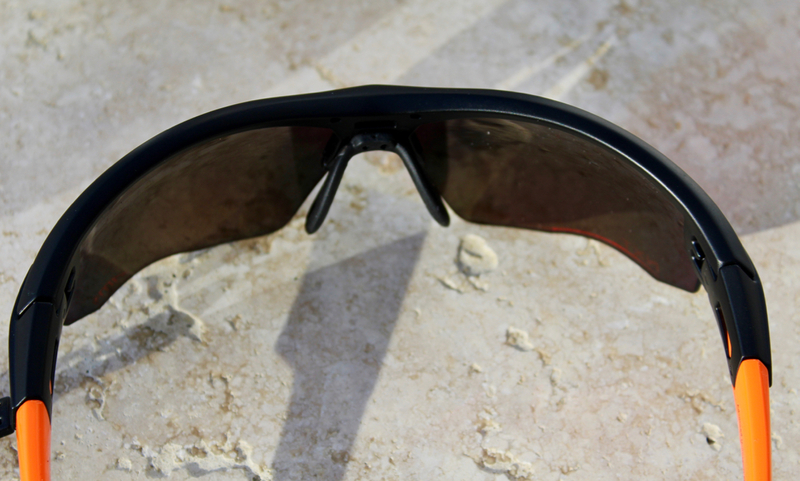 One of the best reasons to consider the AMO Ironcatcher sunglasses is that AMO sport sunglasses use 100% poly-carbonate lens or the PPG industries patented Trivex NXT lenses made from compressed urethane based monomer. The Trivex lenses use the same chemical makeup as the windshields on US Apache helicopters, so you know they are tough. The Trivex NXT lenses are actually more impact resistant than regular poly-carbonate and have crisper optics that cyclocross riders will appreciate. They both comply with ANSI87.1 safety standards, which essentially mean the following is much less likely to happen. Over 25 years ago, I was finishing up interval workout, when I was railing a hard right turn at 30 mph, and split second later my front wheel slid out on a small patch of oil, that sent me sliding across on the tarmac, on my right shoulder, hip and knee. However the first point of impacts was a glancing blow to my right cheek and a forceful ripping of my right elbow. That glancing blow to my cheek splintered my no name sunglass lenses into four pieces, with the sharpest piece ripping a two inch long gash in my cheek. Since that time I have paid close attention to brands that use poly-carbonate lenses since they are stronger and more impact resistance; since making that decision, I have broken some sunglass frames, but I have never had another set of lenses break or splinter from a crash! I have to admit I might be a little on the picky side, so there are few things that could be a little bit better on the AMO Ironcatcher’s… The first thing that I noticed upon opening up the packaging for the first time was that I noticed that the Premium NXT Photochromic Revo Red/ Black lenses contained about a dozen micro-scratches in them. The scratches were smaller then the needle tip of a small needle, so they were not noticeable when I was wearing them, but they certainly existed and could not be buffed out. It kind of makes you wonder about AMO’s quality control. My second disappoint was with one of the features that I really looked forward to testing all summer, that was the hydrophobic coating on the Ironcatcher’s. After watching the video “The Official Ultra-Ever Dry Video” on the lens coating page, and enduring summer rainstorm in the name of product testing, I have to honestly I too say that I am a little disappointed with hydrophobic coating. In my experience I have to say the lenses did not live up to that video. In the video the hydrophobic coating incredibly impressive; the coating was totally repelling water, oil and most important to cyclocross racers, MUD. Although I was disappointed with Ironcatcher’s hydrophobic coating, it wasn’t a total failure, in that first summer rain storm the lenses did form beads, but the beads really did not roll off the lenses effectively, despite possibly being helped by some really bumpy farm roads that was knocking water and debris off my cyclocross frame. As a matter of fact, that storm eventually fizzled out and it then took 30 minutes for every bead to run off the sunglasses or evaporate. After water evaporated minor streaks were visible on the lenses, but they were not as noticeable as most sport sunglasses that I have worn. Overall I give the AMO Ironcatcher’s with Revo Orange Gold lenses four cowbells, they are lightweight, that offer a semi-custom fit with a moldable nose piece and flexible arm tips and fantastic optics from the NXT lenses. The Ironcatcher’s weren’t perfect; our test lenses did have a significant number of tiny scratches, and I thought the hydrophobic coating would have worked better. At pricing of AMO Ironcatcher’s is similar to the leaders in the sunglasses, and I feel the quality is comparable, so it you’re looking for a good pair of sports sunglasses and you’re not concern about brand names you should consider giving AMO a try. Advanced Multisport Optics is based in Hong Kong and likely the base place to find or order is through their web site. The web site does contain lot information, for making an informed decision. Check out our current range of AMO Sunglasses here. BUY NOW at our web shop with discount code SC10 to get an immediate 10% discount. AMO Sports Sunglasses, Designed by athletes, for triathlon, trail running, ultra-running, marathon running, cycling and mountain-biking and loads more sports! Whats in the box : Well, once you get the AMO's out the box, you will find a "Bullet Glass Case" that really does look the part! and it gets better, once you read about the spec on the AMO's website you will read that they have thought there designs through from grass routes sport upwards! AMO Love the Bullet Glass case the Ironcatcher comes in! On the AMO Website when ordering you can chose either Sport Case or a Bullet one, the kind people from AMO have dispatched the Bullet case for me on this review, a very nice strong case this one, holds the Ironcatcher plus the spare lens and cloth with no trouble, not to sure if this is a dearer option when ordering, so be sure to check your order first, I have check and the price does not go up or down for either case. Limited time there is a 20% off code on there website! Frame Spec: The frame is made from Grilamid®TR-90, so they have this right, it makes them strong, and the Grilamid TR-90 is a homopolyamide nylon characterized by an extremely high alternative bending strength, low density and a high resistance to chemical and UV damage, all Frames that are made from the Grilamid TR90 specification are lightweight, resistant to stress cracking and material fatigue and stand up well against UV exposure and extreme temperatures, the frames are really flexible so you will not be breaking these in a hurry! LENS SPEC: AMO's sports sunglasses come with a polycarbonate lens as standard. but AMO also offer a choice of high performance lenses on there website right across the range of Typhoon, Thunderstorm and Transformer series sunglasses. Yellow Lens Premium Polycarbonate Yellow Lens. Model types: I have the Ironcatcher model here on review, AMO offer 3 range's of Sport cycling glasses on there website listed for the road cyclist, plus a range for the mountain biker as well.Each and every pair have the great Grilamid®TR-90 frame, and you also have a fantastic range of lenses to chose from which you decide on when placing a order on there website. Lens change instruction: I personally found the AMO Ironcatcher lens to the easiest I have ever had the pleasure to try! I will run through with you on how to change them from there instruction sheet. Grip the lens in the palm of your hands. Gently pull the frame away at the center and unclip the lens. Finally get the new lens, fix new lens to corner first, then clip lens into center again in the grooves and click into place using the palm of your hand. Clip lens into center again in the grooves and click into place using the palm of your hand. easy as that! My Verdict: Once out on a ride the AMO felt great, fogging was kept to a minimum due to the air vent, and these work really well, on a ride with the rain and wind coming at me from all sides the AMO Ironcatcher did the trick of helping to keep the vision clear, making it a whole lot safer to cycle. Arms: I found the arms were really easy to change, the AMO Ironcatcher comes with a pair of arms if you fancy going jogging in them, in fact the whole frame felt great and unbreakable under normal use. Lens: If you have ever owned a decent pair of cycling glasses, then the last last thing you want to do with them is drop them right! and when that happens your "Heart" misses a beat! and that is what happened to me! I accidentally dropped them, and when I picked them up to check the frame and lens noticed a scratch on the left lens, I tried to get it out by rubbing but cant shift it, most glasses when this happens the scratch get in your line of vision and I noticed even though the lens had a scratch it did not show up on them when I put them on, so no problem, I will try to find out if the Ironcatcher has a protective coating on the lens. AMO have explained the Revo coating more to me. AMO Do say on there website the Revo lens coating is more susceptible to scratching than AMO's other lenses. The AMO lifetime guarantee does not include scratches to the Revo coatings. Out on the ride: On a sunny day the AMO Ironcatcher are great for keeping the Sun out your eyes, and the wind around the face, perfect for the sunny ride out. All set for a very wet ride out to test the AMO Ironcatcher on a very wet day! I Have been out with the AMO on a very heavy down pour and they seemed to cope well with the rain clearing off the lens, and at no time did they mist or fog up on the inside of the lens, but today's ride was a bit different, with very light rain and wind from all sides all the time I was out on the ride, and I found the AMO just could not cope with this sort of fine rain, was a case of removing them to somewhere safe for a while until the rain stopped. I was expecting the AMO Lens I was wearing to have the Hydrohobic water repellent coating on the lens, so I was surprised when the lens could not cope with the light drizzle! The AMO had the worst the weather could throw at them! Will I still be using the AMO on my next ride: You bet I will! I like them, they do the job well in the right condition, comfortable and a great design, how well the lens will stand up to my treatment that is another mater! Value for money, compares reasonable with other on the market..
A MTB ride around the woods, the AMO gave a clear vision ahead, going from sun to the darker area of the woodlands was no problem. AMO Are looking for distributors, drop them a line for more information.Will be updating the review as time goes by. Twitter users can find a 15% discount code on there twitter feed here.... @amosunglasseshk Well worth a look. If readers use discount Coupon code BLOG10 they will get a 10% discountPlease Feel Free to Support Our Sponsors Adverts. Thank You. Check out our current range of AMO Sunglasses here. BUY NOW at our web shop with discount code HC10 to get an immediate 10% discount. A few weeks ago my wife returned home following a trip for ‘groceries’. As I helped unpack I ran across a pair of sandals. This prompted the question “how many pair of sandals do you need?” Her reply, “I’m a girl”, was as smooth and natural as her next breath. Earlier this week I received a box in the mail, its contents strewn about the dining room table. The package contained a pair of new sunglasses and a host of accessories. The sight of the contents and the mess I had made caused my wife to inquire, “how many pair of sunglasses do you need?”. Like deja vu, I was equally smooth and natural in my reply, “I am a cyclist”. AMO sunglasses was started in 2012 by husband and wife team, Tim and Fenny Hallworth. According to the company website, Tim is an obsessive exercise junkie, runner and triathlete and has done numerous ironman triathlons including Kona as well as several ultra-marathons. His wife Fenny is an obsessive ultra-marathoner. 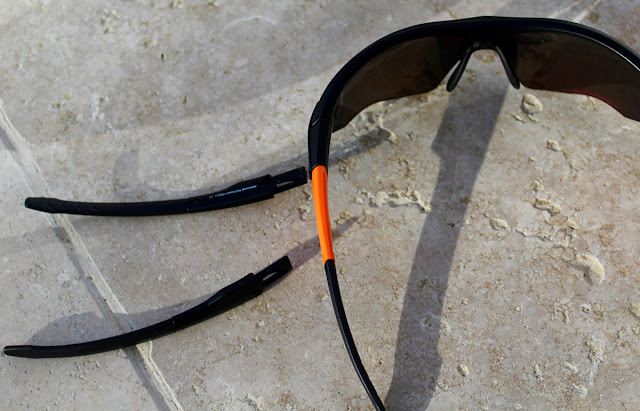 In developing AMO sunglasses, Tim and Fenny drew on their years of experience as competitive athletes to design and develop a range of sport sunglasses specifically for running, cycling and triathlon. Their mission, quite simply is to remove Oakley sunglasses from the top spot and provide great quality functional sport sunglasses to endurance athletes at reasonable prices. The Transformer Frames are a versatile sport sunglass dubbed ‘Transformer’ as they are available with the option of three styles of interchangeable temple arms, six available lens finish options and two different lens constructions. The pair I tested included the standard black (Ironcatcher) temple arms as well as a pair of temple arms in yellow. The arms are a very simple swap out. The Transformers are a very comfortable frame. Lightweight, as one would expect in a pair of sport glasses. The nose piece is also adjustable to allow for a tailored fit at the most critical contact point keeping them in place and unnoticeable on your schnoz. The single biggest pet peeve of mine when it comes to sport glasses is fogging. I generally resort to riding with my glasses on the back of my helmet while climbing in the mountainous terrain surrounding Boulder. This is by necessity rather than by choice as your lenses are bound to become wet and blurred and we all know how well sweat soaked lycra cleans sunglasses. Not so much, leaving you with compromised vision for the remainder of your ride. The vented lenses however did not fog at all. Not while climbing and sweating and not when I reached the top of a climb and stopped to try to force them to fog. This is something I cannot say for any of my other ten or so pair of sport sunglasses. Kudos for the vented lenses and the anti fog construction. 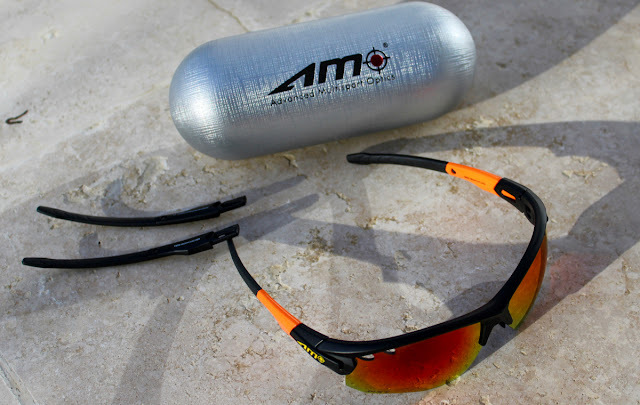 AMO Advanced Multisport Optics makes a great suite of sport glasses and accessories. Check out AMO Sunglasses today and give a pair a try. They are marginally cheaper than their Oakley counterpart and perform as well as any of the Oakley’s I have on my gear shelf. Check out our current range of AMO Sunglasses here. BUY NOW at our web shop with discount code TH10 to get an immediate 10% discount. AMO stands for Advance Multi-sport Optics. Their idea, is that through customer customisation, they are able to provide sunglasses that are tailored to the kind of sports that you partake in, and even to the kind of riding that you do. Whether it is lens design, colour, frame shape or even the glasses case; you have the option to pick and choose. I chose the AMO Transformer model, with photochromic lenses and custom orange arms (to match my Team Wiggle kit). For optimal protection, I went for the James Bond style Bullet case. Straight from the shiny bullet-shaped case, these have a great look and feel to them, as well as a really personalised fit. 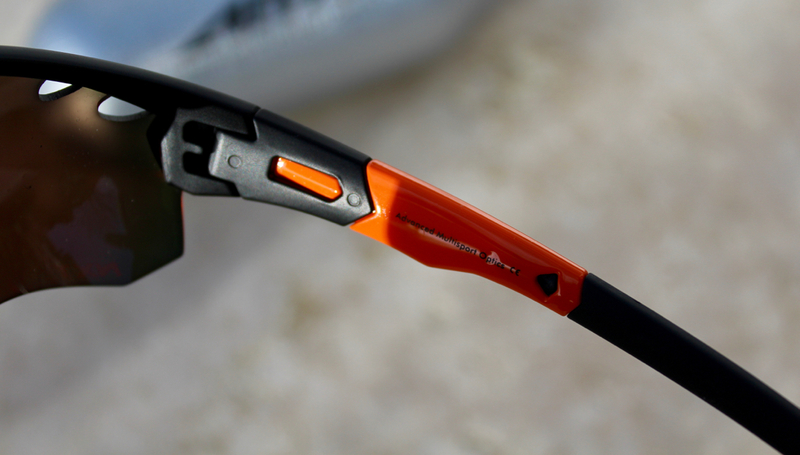 The glasses' frames are made from Grilamid TR-90, which is a light and strong composite, and should withstand plenty of use and abuse. To add personalisation, you can choose the colour of your temple arms, and interchange them with a simple click-and-fit mechanism; giving your model a very personal feel. To personalise the fit, the arms are made of a flexible material called Hytrel, which allows you to 'mould' them to your head shape and avoid any uncomfortable rubbing. The Transformer glasses also have a thermoplastic nose piece, which allows you to tailored its position in terms of height, width and depth on your nose. I have worn these mountain biking, commuting and running, and I have yet to dislodge them or experience any discomfort. Impressive. The lenses are another highlight of the AMO Transformer, coming from the well reputed NXT factory. They comply with all European lens safety standards for protection, as well as holding a Class 1 rating for optical clarity. There is little doubt that they are a high-quality optic, and when you have used high-end lenses like these, you realise why it is worth spending a bit on riding glasses. To add to their clarity, the lenses are also hydrophobic and anti-scratch; making them ideal for UK weather conditions, when road spray and grit will bombard them for a significant portion of the year. I have previously used these hydrophobic lenses on glasses from adidas and POC, and there is a noticeable difference on how well water runs off the lens, rather than beading on the surface. I opted to test the photochromic lenses in the Transformer glasses, which I believe are the optimal type of lens for UK riding; particularly in the winter, when you often get a mix of low sunlight, followed by darkness. AMO do allow you to switch-out the lenses too, with their 'click-lock’ lens system; this means you could use clear or fully darkened lenses in the same frames. More options for personalisation. Overall, these are an interesting new option, from an interesting new brand. The composite used on the frames gives them a slightly different appearance from most high-end sunglasses, but they still look and feel very good quality. The fit is superb, thanks to the lens shape, customisable arm shape and moldable nose piece. The lenses are equally as impressive, with their high-end clarity and photochromic technology. Coming in at a price-point that is very competitive in the high-end category, these could well be worth considering, especially if you are after something a bit different. Check out our current range of AMO Sunglasses here. BUY NOW at our web shop with discount code TW10 to get an immediate 10% discount.